SHAPE what the Father gave ya! Get into the groove with the top faith-based dance fitness program, Shazzy Fitness, with the In The Beginning exercise DVD – an easy to follow, beginner-level dance workout that offers family-friendly hip-hop dance moves. Lead choreographer Vera leads you through two 10-minute aerobic workouts with songs by some of the hottest Christian music artists around! DVD FEATURES: Enjoy fun, “family-friendly” hip-hop dance moves Beginner-level cardio / exercise workout. Perfect for all ages and fitness levels, including children, kids, teens and seniors. What is Shazzy Fitness Workout ? Shazzy Fitness is a dance and aerobic workout program. The music in the workout is primarily Christian hip-hop and Christian rock music. Their fitness program is primarily distributed through DVD. However, they do offer content through online video sites such as YouTube and Vimeo. The beginning level workouts are designed to train muscle groups and offer a combination of isotonic and isometric dance exercises as well as a cool down. 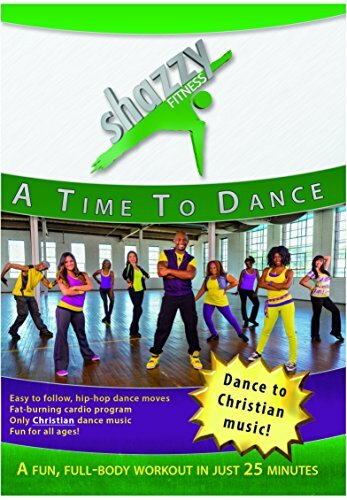 This intermediate high-energy dance fitness workout video is designed by leading faith-based fitness producers Shazzy Fitness to burn fat and calories in just 25 minutes a day through fun cardio dance moves with music that also strengthens your faith. Ideal for dance fans and dance fitness enthusiasts. This fitness DVD begins with an instructional segment, teaching you step-by-step how to do some of the most popular exercise moves included in the workout. Lead instructor Apollo then leads you through family-friendly contemporary dance routines with Christian hip-hop music beats that are consistent with your faith, that you can do with your kids or your grandkids – so much fun it will even make you forget that you’re working out! As seen in: SHAPE magazine, CBN News, Workout Trends and Chicago Sun-Times. SHAPE what the Father gave ya! Dance to a fusion of Christian Hip-Hop & Gospel Rap Music! Burn up to 450 calories in less than 30 minutes! Ideal for dance enthusiasts. Step by step instructions. SHAPE what the Father gave ya! 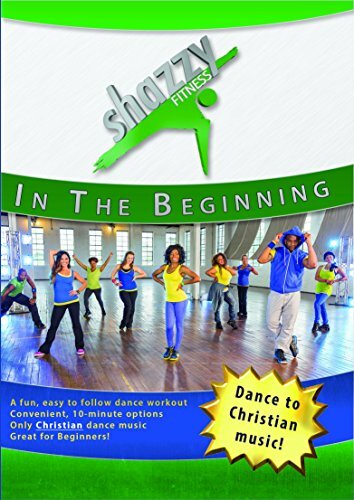 Get into the groove with the top faith-based dance fitness program, Shazzy Fit, with the In The Beginning exercise DVD – an easy to follow, beginner-level dance workout that offers family-friendly hip-hop dance moves, and includes heart-pounding Christian & Gospel hip-hop songs. This video begins with an instructional segment, teaching you step-by-step how to do some of our most popular moves. Lead choreographer Vera leads you through two 10-minute aerobic workouts with songs by some of the hottest Christian music artists around! Dance to a faith-based fusion of Christian Rock and Gospel Hip-Hop Music!